Well, maybe not. But it could certainly help some. The world seems to be split between spooners and people who don’t sleep well snuggled up, either because it’s too warm or they need to move around more in their sleep. The world is also split between snorers and non-snorers, and the rate of snoring tends to rise with age, so your wonderful husband or wife may have put on a few pounds and entered the snoring category over time. Heavy snoring edges into sleep apnea — where the airways or so obstructed breathing actually stops several times a minute. If your partner seems to stop breathing then recover with a jerk several time a minute, you should encourage them to see a sleep specialist — apnea is life-shortening and can cause dangerous daytime drowsiness. Having separate beds or even separate bedrooms, if you can afford it, are excellent ways to improve sleep quality for both partners. Many people have this arrangement already, but it is still not socially acceptable. So what’s holding me back from selling our king mattress and ordering two twins? Society! 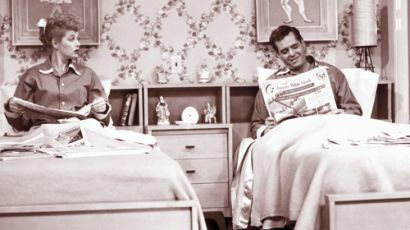 Mention separate beds today and most people assume marital troubles. I don’t suffer from inflammation. I do suffer from bad sleep. And chronic bad sleep, according to Bartolucci, has been shown to increase the likelihood of stroke and heart attacks. It makes people more susceptible to developing not only health problems like diabetes and high blood pressure but also conditions like obesity that increase the risk of major health issues. It also contributes to or exacerbates psychiatric problems like anxiety, depression, and attention deficient hyperactivity disorder. Why must we risk these things just to prove to ourselves that we are happy couples? Separate beds means better sleep, which in turn can produce healthier spouses and a happier marriage. I rest my case. Though when I gingerly mentioned this theory to my husband and he agreed with me, I did feel a tiny bit hurt.